out of doors all afternoon. I fixed up my chicken house some. Will is helping with the farm work. weather pleasant. Wednesday April 16th 1890 I worked all the time I could spare from the housework to clean up the back yard and make a piece of sidewalk by the back porch. Will took the plasterers to the West farm today. he came early and went down to Holsons for another horse to take the place of Ed McCallisters "Daisy" that he sold and delivered last night. He brought the men in at night. 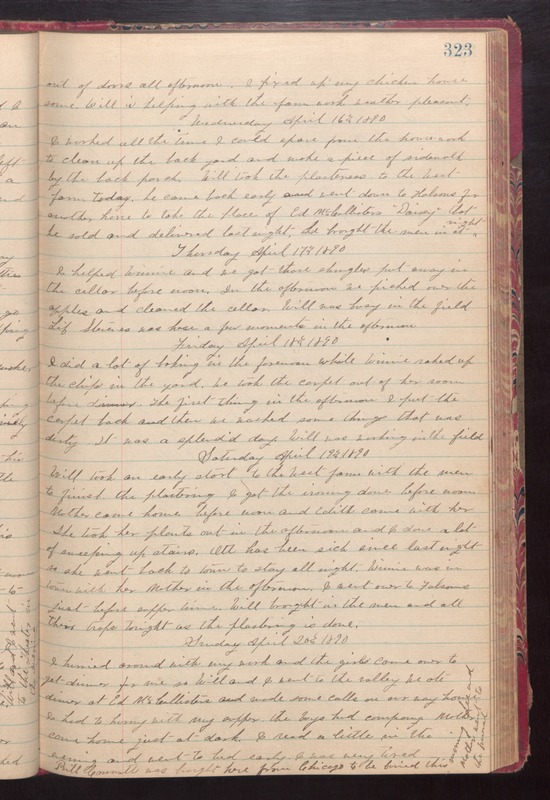 Thursday April 17th 1890 I helped Winnie and we got those shingles put away in the cellar before noon. In the afternoon We picked over the apples and cleaned the cellar. Will was busy in the field Lif Stevens was here a few moments in the afternoon. Friday April 18th 1890 I did a lot of baking in the forenoon while Winnie raked up the chips in the yard. We took the carpet out of her room before dinner. The first thing in the afternoon I put the carpet back and then we washed some things that was dirty. It was a splendid day. Will was working in the field. Saturday April 19th 1890 Will took an early start to the West farm with the men to finish the plastering. I got the ironing done before noon Mother came home before noon and Edith came with her. She took her plants out in the afternoon and I done a lot of sweeping up stairs. Ott has been sick since last night as she went back to town to stay all night. Winnie was in town with her mother in the aftrernoon. I went over to Folsoms just before supper time. Will brought in the men and all their [traps?] tonight as the plastering is done. Sunday April 23rd 1890 I hurried around with my work and the girls came over to get dinner for me so Will and I went to the valley. We ate dinner at Ed McCallisters and made some calls on out way home. I had to hurry with my supper. the boys had company. Mother came home just at dark. I read a little in the evening and went to bed early. I was very tired Bill [Connatt?] was brought here from Chicago to be buried this morning. Lee and Mother went to the funeral.